You know that while airplanes fly through the air, they’re still technically on planet Earth. You also know that at some point, a vehicle could get so high up that it would be in outer space. That all seems a bit vague, but it turns out, space has a definite on-paper start point, and it’s precisely 327,360 feet up. That point is known as the Kármán Line, and “327,360" is not just an unwieldy number, it’s also in the wrong Imperial system, so it’s better to just go with its official definition of 100 kilometers, or 62 miles. I’m a big dummy, so I thought that “100 km” number was just pulled out of thin air by scientists. I mean, a nice, even “100" is just a bit too convenient, isn’t it? To fly at 70,000 feet, the U-2 has very long, slender wings to cling to that very thin air. It also has to be going pretty quickly, too, so that what air there is is moving fast enough over those wings to generate lift. Any slower than that, and it’ll stall, even if it’s moving at 350 mph. What the Kármán Line denotes is a similar idea to the coffin corner, but instead of the risk of losing control of the vehicle at a Critical Mach Number, the real problem is the risk that you’ll just start zooming off into deep space. Essentially, once you get to about 62 miles up, the air is so thin that your theoretical airplane has to be traveling fast enough just to stay aloft that you would escape the clutches of Earth’s gravity anyway based on speed alone (for those wondering, it’s a little above 17,000 mph, give or take a few thousand here or there). Speed up, you go blasting off into space. Slow down, you fall out of the sky. That’s the Kármán Line. So why does the U.S. government award astronaut wings at 50 miles up, instead of at the 62-mile mark of the Kármán Line? It turns out, that’s just what the U.S. Air Force felt like defining space as back in the 1960s, according to NASA. 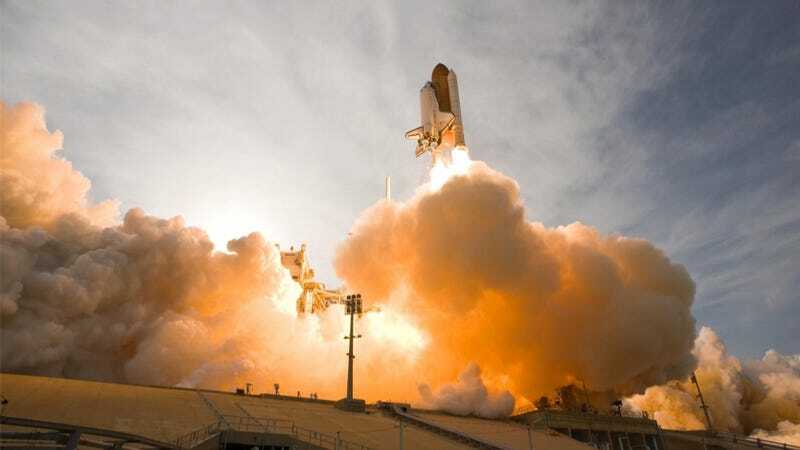 NASA use 76 miles as their re-entry altitude, the point at which atmospheric drag is noticeable and the space shuttle can switch from steering with thrusters to maneuvering like a conventional aircraft. So it turns out that space doesn’t just start where the sky goes all black, or where you start to get a space-y feeling. It’s much more than that.